Lake pool & pond Management Ltd has been formed from a background of 25 years experience in heavy plant and construction and 30 years experience of fishery and water management. Our professional dedicated and courteous staff are always on hand to help with any type of water management the client may require. We also supply erect and install all types of predator protection including various types of otter fencing. 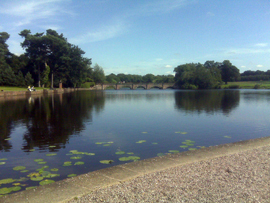 We specialise in construction and repair/replacement of all types of sluices and boathouses. We are always on call to help with anyt water quality issues from testing to rectification including habitat improvement. We undertake all aspects of bank side works including bank clearing, erosion preventation and reinstatement and swim construction including disabled swims. We know how important and valuable fish stocks are and how easily they can be devastated practical;y overnight by the effect of predation. We specialise in the supply, installation and maintenance of all types of predator protection including various types of otter fencing designed to protect your valuable stock. We supply and install various types of Hydro power units. These can be situated in any water flow a brook, stream or river and can also be sited in a lake outflow and will create various power outputs to generate electricity to power your home or business and also have an excess of output to sell back to the national grid. We design and construct all types of irrigation reservoir and undertake all aspects of agricultural drainage, ditch clearing and de-watering, also included in our scope of works is irrigation of golf courses, football pitches. Bowling greens and horse race courses. We can supply and install many different types of domestic and commercial fountains for lake aeration and cosmetic decoration see our portfolio for some of the stunning effects we can create. Excavators from 1.5 ton to 45 ton. Long reach excavators from 13 ton to 35 ton. 13 ton and 16 ton rollers. Dump trucks from 3 ton to 40 ton. Full range of bulldozers to a massive Cat D9t. We take great pride in the work we accomplish. All our staff have a genuine interest and passion for the work we do and if we did not need to make a living we would do it for nothing our aim is 100% customer satisfaction. 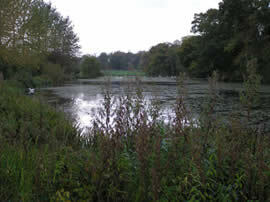 This picture shows a lake in Shropshire Managed by LPPM Ltd that was originally unfishable because of extensive weed growth. Contrast this with the 2nd picture after careful treatment. 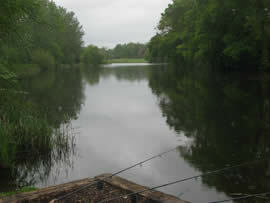 This is a private country estate lake and fishery that we do work for in the heart of Cheshire.